Nicholls gets his name on Patchquick Trophy at first attempt! Race Report, Highlights and Results! Back on Wednesday evening 13th June the 71st running of the Patchquick Trophy event which this year had kindly been sponsored by TyreMarks of Tavistock took place at Little Silver Moto Parc on the outskirts of Exeter in Devon. 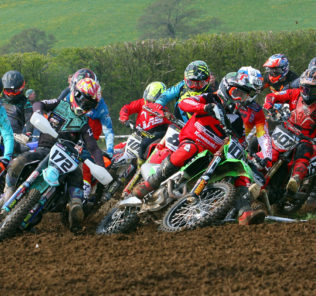 This year’s event had attracted nigh on a full entry and included many of the country’s top riders and with it was too attract some 2,000 plus spectators who were in attendance on what was a well prepped track with excellent viewing. Topping the line-up and expected to be a front runner was current British MX1 Championship leader Jake Nicholls on the Buildbase Honda who made the long trip down from East Anglia to have his first attempt of getting his name inscribed alongside many of the greats already on this famous Trophy, but there was plenty of other talent all looking to do the same. In the opening Patchquick Trophy race it was team mate to Nicholls Josh Gilbert who was on a 450f Buildbase Honda rather than his normal 250f who had first pick at the gate as he had qualified the fastest, but as they entered the first corner it was Nicholls who had the holeshot from the Rob Hooper Racing Yamaha of Ryan Houghton and last year’s winner Jake Shipton on the Crescent RFX Yamaha, but not the best of starts for Gilbert who was back in about 10th. Nicholls had a clear track ahead of him and was to ease away from Houghton who had Shipton all over him like a rash for the first couple of laps, but all eyes were on Gilbert who was now up in to 4th. Shipton was eventually to get pass Houghton on lap 4 and was to try and close down the gap on Nicholls which was some 5 seconds, but it was a tall ask as Nicholls was in dominating form and went on tom take the Chequered flag with Shipton 2nd and after a long tussle with Houghton, Gilbert found away pass on the last lap to take 3rd. In the second moto this time it was Josh Taylor on the DirtWheelzUK Kawasaki with the best start from Nicholls and the Wheeldon Farm Off road Kawasaki of Joe Clayton, but several riders were to go down behind them including Gilbert, Alex Snow and Shipton. Gilbert managed to get away in mid pack, but not Shipton who was right at the back of the field as was Snow who was to pull out. Meanwhile back at the front Taylors lead was short lived as within a third of the opening lap Nicholls took over at the front and was soon in to a rhythm and eased away. Dan Thornhill on the Cab Screens Honda was to move up in to 2nd on lap 3, but as with the opening race all eyes were on Gilbert who was storming up through the field as was Shipton, but a rear wheel moose problem was to force Shipton out on lap 6. Houghton was also on a mission and moved past Taylor on the same lap, but soon to be breathing all over him was the flying Gilbert who found away pass 2 laps later and was soon chasing down Thornhill in 2nd and was to catch him with 2 laps remaining and had a real ding dong. Nicholls was to take a comfortable win, but who was it going to take 2nd as Gilbert was trying allsorts, but Thornhill held strong and took it by literally .2 of a second. As the last race got underway the light was fading and a good start was the thing to have and that was exactly what Nicholls did from Shipton and the D S C Cornwall Kawasaki of Luke Sturgeon, but with a clear view in front of him Nicholls wasted no time at the front and powered away. Gilbert had a better start in this won and by the end of the opening lap was sitting in 3rd and was giving chase. Houghton was also on a charge in the early stages before he was forced to retire with no front brake. Nicholls was to go on to take the win to make it a hat trick on the night with Shipton 2nd just a head of Gilbert who took 3rd, but the applause was for Nicholls who was declared Patchquick Trophy winner 2018. In the B group which was for the Speed Trophy there was great drama as it was Brandon Baker who led the race for the first couple of laps before Mark Cornish took over, but soon to be all over Cornish was Rick Hanson who was on a real mission and was to pass Cornish a lap later to take the lead and it looked as if Hanson was going to take the win, but a big off on the last lap ended his race and Cornish regained the lead, but he was to be denied the win just before the end by the enduro ace Ricky Wiggins with Ben Gibbons who had fought his way through from 18th on the opening lap taking 3rd. In the second moto Gibbons had the best start from Jordan Watts with Baker in 3rd, but a bad start for race 1 winner Wiggins who was down in 17th at the end of the opening lap and had it all to do. Gibbons was to pull away on the first couple of laps and Watts was to drop down to 4th after being passed by Finton Jones and Baker. Gibbons went on to take the win with Jones 2nd but a late surge on the last lap saw Watts pass Baker and was to finish 3rd. The last group saw dominance from Matt Daines who blitzed the rest of the field with two convincing wins.